One of our client from Kenya has finalized an apartment in London for the higher studies of her daughters. 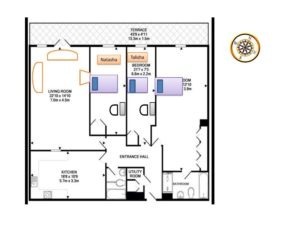 We have received a layout from her to conduct long-distance consultation for quick assessment according to vastu principles. One of the highly recommended square shape of the above house keeps the positive energy flowing freely through the house without any hassles. 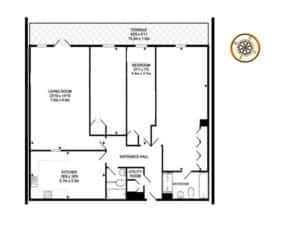 Front door location always improves the luck of occupant, is located towards the auspicious zone. It creates unlimited career opportunities to come your way. In the above layout, the main door falls in “Southeast zone” which is highly inauspicious. As a result, it may bring misfortune & suffer from poor health. If your kitchen isn’t arranged based on vastu principles, it may create health & financial issues. The layout shows the kitchen in the south zone whereas an ideal location for the fire is towards the south-east zone. Therefore it may result in a digestive problem. It could also create a negative nourishment area. Location of toilets in south-east and east zone has a bad impact of the members staying in the above house. Probably it needs great bullet vastu remedies to bring refreshing energy into the house. Open terrace towards the north & north-west is auspicious to attract overseas opportunities for studies & job. For any area of a home that is not according to the vastu tradition, a person can make the necessary modifications as well as alternative remedies to create a home that brings peace & harmony. Do space purification, by moping a floor with Himalayan salt. This will clear off the negative vibes of the previous occupants from the location. Using a Tibetan bell or singing bowl are also an alternative way to purify the space with the fresh energy. Improve the energy of south-east entrance by keeping a natural green aventurine tumbled stone close to the main door. Green aventurine is a stone of great opportunities. Keep green colored welcome doormat at the entrance. Place crystal bowl containing mountain salt in the bathroom area. It removes negativity from the wrongly placed toilets in the house. Replacing a salt once in a week is mandatory. Sleeping direction as per the modified plan. This ensures that energy flows in the right direction and help you achieve a quality night sleep. Since the house was exclusively for the students for their higher studies, the desk should be placed facing the northeast, a zone of tranquility & knowledge. A cosmic energy sourcing direction- northeast improves student’s memory and concentration power. Vastu rating B+ (good to stay for 5 to 7 years) for above house in London. Are you buying a new property? Would you like to evaluate the new or existing property? The team has provided long-distance consultations within India as well as vastu consultant in london (UK), New Jersey, Chicago, Los Angels, Bangkok, Pattaya, Dubai, Ajman, Abu Dhabi, Sharjah, Indiana, Moscow, Sri Lanka, China, and also France.